From changing your name or password, to customizing Hotmail's look, etc. We will go through all preferences available under the "Hotmail Options" screen. These tutorials are updated regularly as the Windows Live team adds more features to the Hotmail webmail service (like the relatively recent of support for keyboard shortcuts in Hotmail). Windows Live Hotmail offers many options "on-the-fly", like configuring the importance of an email, the rich-text or text-only format setting for new email, etc. These options are not "persistent" settings, and are only applied for the current email, contact, etc. - and they revert to Hotmail's defaults the next time you perform the action in question. These on-the-fly options are treated in the tutorial that best fit the topic. Our Hotmail options and settings tutorials, on the other hand, show you how to set persistent preferences that pertain to behavior or appearance. The first settings you can configure in Hotmail are how you login: if you sign in to Hotmail from a public computer, for example, you will need to take certain precautions to protect the confidentiality and integrity of your Hotmail account. Part of the settings are discussed in our Hotmail sign in tutorial, and the remainder are covered in the detailed tutorial dedicated to the Hotmail login process (how it works, and what happens behind the scenes after you login to check your emails). Understanding what the sign-in options are, how the login process works help you make better decisions when it comes to the most important aspect of using Hotmail: protecting your account. Not very well known is the fact that Hotmail lets you setup "mail forwarding" on your account, so that any emails sent to your Hotmail address are automatically forwarded to another email account of your choice: this is a useful way to keep your Hotmail account opened, without having to check it regularly in case you are now using another email address most of the time. Learn how to setup mail forwarding in Hotmail. In many cases, this will be an easy-to-setup and safer alternative to actually deleting your Hotmail account, which can also be done. On mail forwarding, as you'll see in the tutorial, note that a copy of the email being automatically forwarded can either be kept inside your Hotmail inbox, or automatically deleted after it has been forwarded. 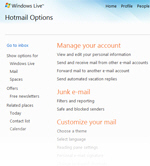 A series of settings can be customized in your Hotmail account, which do not affect the actual sending or receiving of emails: a useful option is to configure Hotmail to go directly to your inbox after you login, without showing you the "Hotmail Today" page: while Hotmail Today has some usefulness, most people go to Hotmail.com only to check their emails, and skipping this page to go straight to your inbox saves you a few seconds every time you check your emails. In a recent update, Windows Live Hotmail has been automatically customized to load the page, or screen, you were last looking at: if the last time you closed your Hotmail browser window, you were inside the Junk folder, the next time you open Hotmail, it will automatically bring you back there. This isn't an option you can currently configure Hotmail to do, but a little extra setting that, in most cases, will save you at least one click! Whether you want to practice another language, or want to use the generic "Hotmail.com" address instead of a local one to check your emails, you can simply configure Hotmail to use a different language: this will not translate your emails of course, but show all the command names in the language you selected. We have not written a tutorial for every language, but changing the language you want is the same regardless: see how easily you can start using Hotmail in English, or “Hotmail en español”!